These Individual Cheese & Herb Stratas are surprisingly simple to make, adding flavorful flair to your brunch menu. Side dishes are some of the fastest-growing menu items, helping to boost both traffic and check averages. TABASCO® brand Garlic Pepper Sauce --- 3 Tbsp. Butter, melted --- 6 Tbsp. Bell pepper, finely minced --- 3 Tbsp. Preheat oven to 400°F. Spray bottom and sides of ramekins with nonstick cooking spray. Brush or dab each side of the prosciutto or ham lightly with the TABASCO® Garlic Sauce. 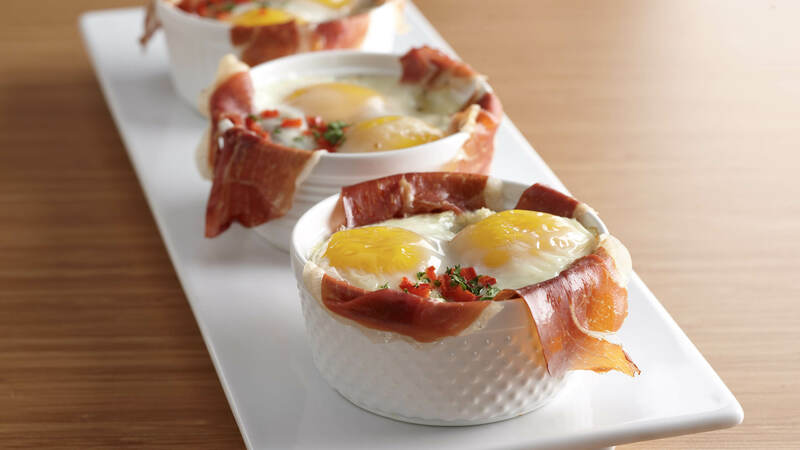 Line each ramekin with 2 slices prosciutto or ham with some extending over sides. In large bowl, toss bread pieces and butter together. Stir in cheese and herbs. Divide mixture evenly among ramekins pressing down lightly. If additional spiciness is desired add some or all of the remaining TABASCO® Garlic Sauce. Break 2 eggs into each ramekin. Add salt and pepper, as desired. Sprinkle bell pepper around eggs, if desired. Place ramekins on rimmed baking sheet. Bake in 400°F oven 25 to 30 minutes, until whites are set and yolks begin to firm, or to desired doneness. Garnish with additional herbs, if desired.